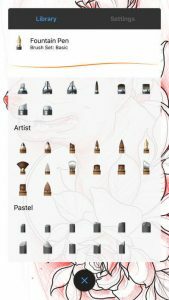 Autodesk SketchBook is the award-winning drawing app from the leader in computer-aided design. It’s made for creative professionals, aspiring artists, and anyone who likes to capture their ideas in digital form. Known for its natural drawing experience and clean user interface that gets out of your way, SketchBook has everything you need to create beautiful digital art. The brush engine has 170 default brushes you can customize, so they’ll always perform exactly as you expect. Ink feels fluid and smooth, synthetic brushes blend colors in a natural way, and texture brushes mimic natural media. The SketchBook drawing and rendering engine was designed to use the full computing power of every iOS device (especially the iPad Pro with Apple Pencil). Rapid UI mode gets a thumbs up from our users because it lets your free hand pull up interface elements when needed for the largest possible workspace on your iPad. Radial Symmetry: Product designers and mandala makers alike love the ability to draw once and replicate their lines up to 16 times using Radial Symmetry. Predictive Stroke: Draw a line and our Predictive Stroke assertive technology will make your line straight. Draw a basic shape and it will make your circles, rectangles, and triangles more precise. If you’re drawing freehand, it will add just the right amount of smoothing to curved lines. Don’t need help? Turn it down or turn it off. Ruler and Ellipse: Perspective is everything in drawing and our Ruler and Ellipse tool will help ensure you’re realizing the correct positioning, size, rotation, and aspect ratio. Full Layer Support: SketchBook opens and exports Photoshop documents (PSD files) natively, preserving layer names and blending modes. Scan Sketch: With a quick snap of your device’s camera, SketchBook can transform your paper-based line drawings into digital form. Great for getting new life out of old drawings or for making the transition to an all-digital workflow. Autosave and infinite Undo: There’s nothing worse than losing your work, and there’s nothing better than being able to step back in your workflow a few dozen times to give it another go. SketchBook saves both your work and your patience. A SketchBook subscription is a simple way to ensure you get the best SketchBook experience on all your devices. As a subscriber, you get every new feature, every update, every tool, and the ability to use SketchBook on any device. SketchBook Subscription includes access to SketchBook Motion, the 2016 iPad App of the Year (install it separately via iTunes). Purchase a subscription here in the App Store and your SketchBook subscription will unlock the Pro toolset on all your other devices. Subscriptions are charged through your iTunes Account, for USD $29.99/year or USD $4.99/month. A one-time Pro Tools purchase puts these drawing tools on one device. A subscription gives you access to all drawing tools on all the devices we support (Mac, iPhone, iPad, iPad Pro). Subscription automatically renews for the selected period, unless auto-renew is turned off at least 24-hours before the end of the current period. You’ll receive a reminder email prior to the end of your current subscription period. Manage subscription preferences in iTunes.